Amongst our clients we are enlisted as the well known manufacturer and supplier of Mild Steel Rack. The products are fine in finish. 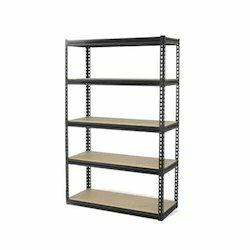 Owing to rich experience and knowledge, we offer our esteemed clients a range Mild Steel Rack. The range is designed by professionals who hold vast expertise in this domain. The range is highly strong enough to bear heavy load and pressure. Various levels and sections are made to store various types of items. Offered range is highly spacious.